What is WordPress? It is currently the most popular content management system (CMS) in the world. 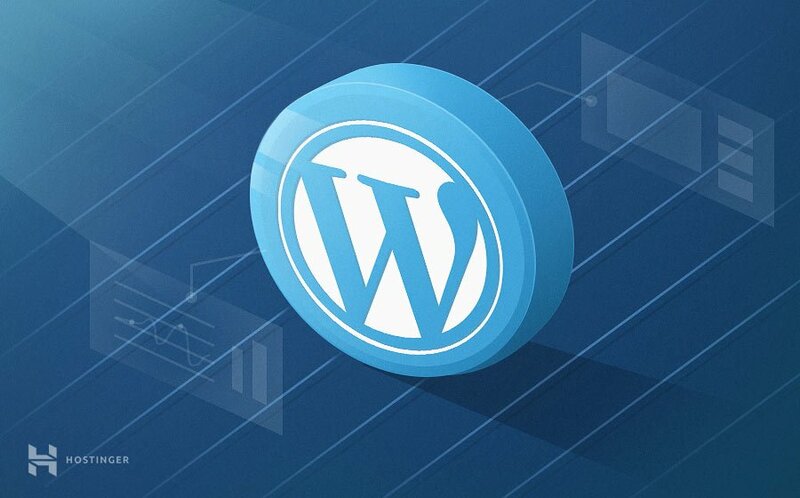 WordPress powers more than 30% of the websites around the world — and it’s rapidly growing! Overall, a content management system is a web application that allows website owners, editors, and authors to manage their website and publish content without any programming knowledge. WordPress uses PHP and MySQL, which is supported by nearly all web hosts. But a specialized WordPress hosting plan can give you the edge in terms of speed, performance, and reliability. Usually, CMSes are used for blogging, but a WordPress site can easily be turned into e-commerce store, portfolio, newspaper website or anything else your heart desires. One of the best things about WordPress is that it comes with an intuitive and user-friendly interface. If you know how to use Microsoft Word you don’t need to worry about WordPress; you will be able to create and publish content just as easily! The best part is that WordPress is open-source and free for everyone to use. 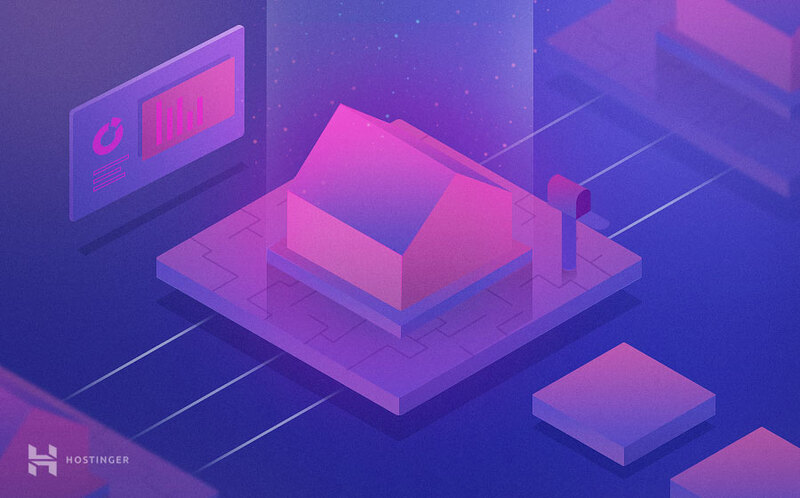 In fact, it allows millions of people around the world to have a high-quality, modern website — even for the smallest players. The journey of WordPress started in 2003 when two developers, Matt Mullenweg and Mike Little, began to build a new blogging platform on top of a discontinued software called b2/cafeblog. Shortly after that project was abandoned, they decided to fork it and continue the development on their own terms. They released the first version of WordPress (WordPress 1.0) in January 2004. It looked quite different from the feature-rich content management system that these days we know as WordPress. 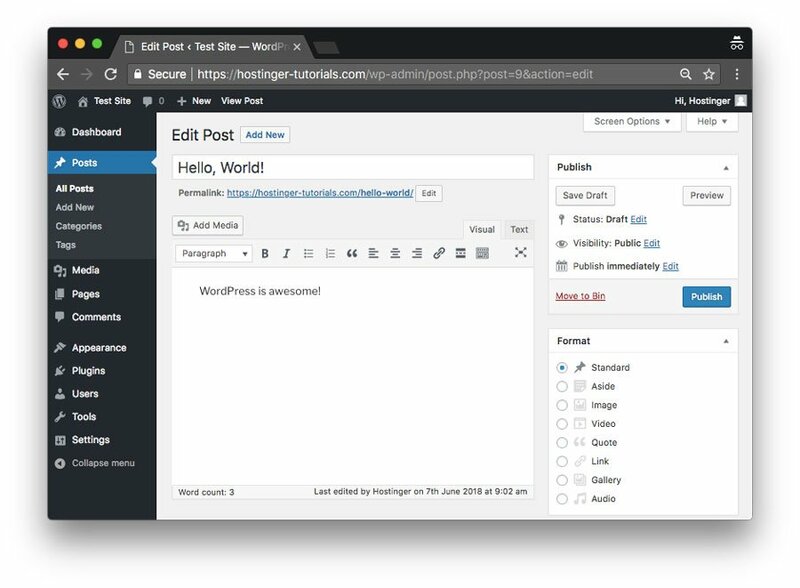 However, it already had most of the core features we still use today, such as the WordPress editor, a simple installation process, pretty permalinks, a user management system, comment moderation capabilities, and others. Since 2004, WordPress has gone through an incredible transformation. Nowadays, the WordPress project is developed, managed, and maintained by a dedicated open-source community of thousands of worldwide members. They work remotely, many of them as volunteers, and meet in person at WordPress’ distributed conference called WordCamp. WordPress is still rapidly growing and a new version is released every 2 or 3 months. Each version adds new features and security updates to the platform. When you look up WordPress in Google or another search engine, you will find two related websites: WordPress.com and WordPress.org. First, this can be confusing, however, both sites have their own purpose and user base. WordPress.org is the website you need if you want to run a self-hosted WordPress site. Here, you can download the platform and find a plethora of free plugins and themes. To host your own website, you also need to register a domain and sign up for a web hosting plan. WordPress uses PHP and MySQL to run, which is something that all web hosts support. However, there are also specialized WordPress hosting plans which are based on a hosting environment specifically optimized for the best performance of the CMS. Want to start a website? Hostinger has a special WordPress hosting offer just for you! One-click setup, 24/7 support, and all you need to start a successful website. 30-days money-back guarantee included! WordPress.com is a hosting company that uses the WordPress content management system for all the blogs it hosts. Users who sign up for the service get their own blogs with a myblog.wordpress.com type of domain (however custom domains are also available as a paid feature). The default plan is free, though it comes with some limitations. What Kinds of Websites Can I Create with WordPress? WordPress is an extremely versatile tool that you can use to create several different kinds of websites. In fact, the possibilities are endless but we have collected some more common ways of usage to give you a better insight. WordPress started as a blogging tool and that’s still one of the most frequent use cases of the platform. You can start small with minimal cost, for instance with Hostinger’s beginner-friendly survival plan. Then, as your blog gets more and more exposure, you can upgrade to more advanced solutions. Freelancers, artists, photographers, musicians, writers, and other creative professionals frequently use WordPress to build their online portfolios. There are several portfolio themes available on WordPress.org and elsewhere that include all features you may need, such as image galleries, lightboxes, and portfolio grids. If you have a small business you will also find WordPress to be a good solution for your website. Although WordPress is extremely popular with SMEs, it’s more and more frequently used by large corporations, too. As WordPress has a low cost of maintenance and a relatively flat learning curve, it’s not surprising that it’s the favorite platform of charities and churches as well. Thanks to WordPress, these days more nonprofits have an online presence than ever before. With WordPress, you can also create an online shop without any programming knowledge. WooCommerce, the most popular eCommerce plugin for WordPress allows you to add crucial features such as shopping carts, an order management system, checkout pages, one-click refunds, and others to your site. Although WordPress is mostly known as a platform for bloggers and small businesses, it’s also used by many notable websites. The entire ecosystem of the popular The New Yorker magazine is powered by WordPress. TechCrunch is the go-to site for people interested in cutting-edge technology and startup news—maybe it’s not a coincidence that they chose WordPress as their platform. 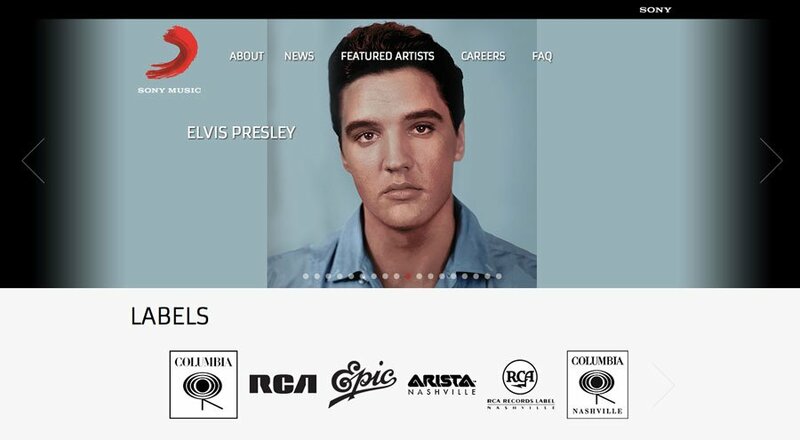 The website of Sony Music is a great example of successful commercial brands making use of WordPress. The official .gov website of the White House also runs on WordPress. Who would have thought? WordPress is incredibly popular with artists, photographers, musicians, and other creatives—even with the famous ones. Beyoncé is one of them; WordPress empowered her to deliver an engaging user experience to her fans. WordPress has several advantages and it’s by far the best platform for anyone who wants to run a website without any programming knowledge. Besides, it’s also a good choice for programmers, as it’s a highly customizable tool. However, it also has some pitfalls you need to be aware of. Low cost – You only need to pay for the domain and web hosting. The WordPress software and many of the plugins are themes are free. Easy installation and update process – Unlike many other content management systems, WordPress needs zero configuration and you can update it with a single click. Simple to manage – You don’t need any programming knowledge to perform everyday tasks such as writing and editing posts, uploading and editing images, managing users, adding menus, and installing plugins and themes. Custom design – With thousands of ready-for-use WordPress themes, you can easily create a custom design that fits with your niche. For instance, there are specific themes for restaurants, medical practitioners, small businesses, food bloggers, etc. Custom functionality – You can make use of plugins to extend WordPress’ default functionalities. Basically, you can find a plugin for every specific task from search engine optimization to event booking. Helpful community – WordPress has a worldwide community and a super helpful support forum. If you don’t know something or have any problems you will quickly find help. Security concerns – As WordPress powers more than 30% of the web, it’s also frequently targeted by hackers. However, if you install a security plugin you can hugely reduce the risk. Third-party content – As most WordPress plugins and themes are created by third-party developers, they are sometimes buggy. Before installing a new plugin or theme, always read the description and reviews and if you are still not sure ask for support from the community. Page load time – If you have too many plugins your site may become slow. Installing a caching plugin can usually solve this problem, though. What Is WordPress? The Most Popular CMS in the World! WordPress is an incredibly versatile platform. It allows you to build basically any kind of websites. Do you want to start a blog? WordPress is the answer. Does your small business need an online presence? Again, WordPress. Do you want an online portfolio to attract new clients? Still, WordPress. Do you plan to start a webshop? Of course, WordPress. Your options are countless, the risk is low, and you can easily get help from many different sources.